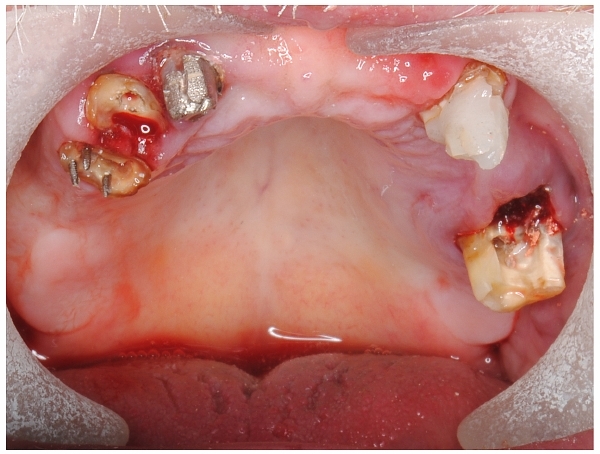 A case report of the use of telescopic crowns to restore an upper arch of teeth. Patients in many European countries are increasingly conscious of the aesthetic potential, practicality and cost effectiveness of precision connecting elements, such as telescopic crowns and attachments. Whilst relatively unknown in the UK, the methods are within the reach of many UK dental practitioners with recourse to good dental technicians and this article gives an illustrated overview of the basic principles of these techniques. In the following article you will find a case solved with so called TK1 telescopes in co-operation with my German dental lab. This technique is not new; in fact I used to provide telescopic crowns in my practice over 20 years ago. I gave up partly due to the constraints of the NHS contract – at the time, the costs seemed relatively high and my local British dental technicians seemed unable to produce the high quality, precision fit necessary to get the results I desired. Today more treatment is provided privately; the costs can often be lower than providing implants and, at last, I have found a dental lab (Teeth ’R’ Us) that can provide the high quality, precise fits necessary to get the best from this technique. In Germany they seem to provide this treatment more frequently and so, have perfected the telescope crown retained prosthesis technique more than we have in the UK. In fact it is often called the German crown technique. 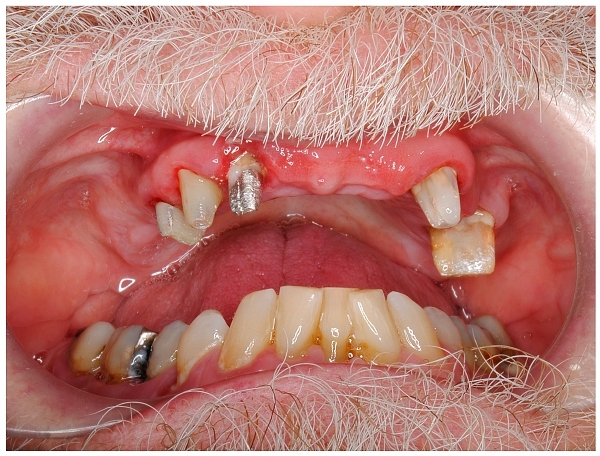 A 69 year old man presented with a failing upper arch of teeth. He had extensive crown and bridge work, provided about 20 years before, to replace a conventional denture that he had been unhappy with. Over the last few years he had lost several posterior teeth. This lack of posterior support meant that there was an increasing amount of pressure on his large upper anterior bridge. The large upper anterior bridge had recently worked loose a couple of times and required root canal treatment and a post at his upper left canine tooth (tooth 13), which had weakened the abutment at the left side of the anterior upper bridge. The posterior bridge on his upper left side had recently been sectioned when the mesial abutment (tooth 14) had failed and had to be removed, leaving the pontic cantilevered off the molar (tooth 16). This upper left molar (tooth 16) had infection in the trifurcation area (between the roots) and so was failing. Dentures are usually the quickest, easiest and cheapest way to replace missing natural teeth. All that’s needed is an impression of the mouth and a few measurements, such as the way the teeth bite together. The dental technician then makes the dentures and they are usually ready to be fitted within a few weeks. 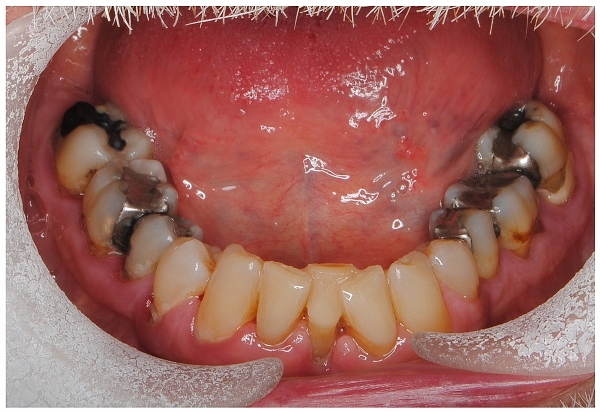 The patient did not want to have his palate covered with a dentFig.He had experience of wearing a denture before. Previous dentures had been loose and he found that he did not enjoy eating his food as much when he was wearing a dentFig. On a partial denture sometimes clasps can spoil the cosmetic appearance of the prosthesis and, with heavily restored natural teeth, it can be difficult to get a good colour match with the denture teeth. Implants seem to be a good option but add considerable financial cost to the treatment and not all patients can afford the extra expense. Implants also involve more complex and invasive treatment and a much longer treatment time (usually at least 4 to 6 months), which is not always acceptable to the patient. Sometimes there is insufficient bone and frequently there is poor bone quality in the upper molar areas which leads to compromises in the final prosthesis. This usually leads to a shortened dental arch with only ten anterior teeth. Some specialists feel that this lack of posterior support can upset the temporomandibular joint. 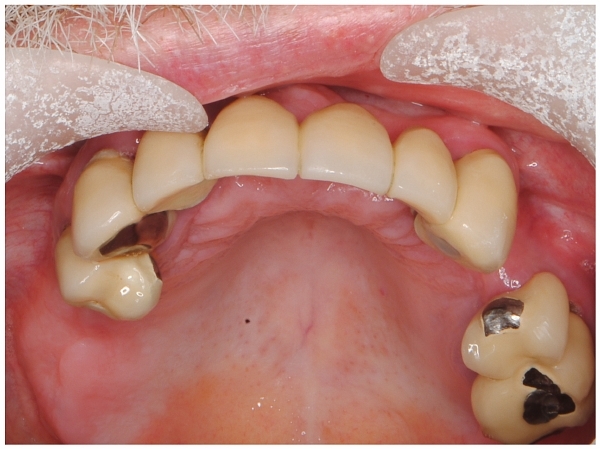 Lastly, the cosmetic results can sometimes be disappointing with an implant retained prosthesis, as the prosthetic teeth often have to be made very long or misshaped to fit into the bone and the space where the implants can be placed. This is more of a problem in patients with a high lip line. A conventional bridge would have been possible, but was considered inappropriate because there were insufficient abutment teeth to support a bridge, no distal abutment tooth on the upper right side and, with a history of failing abutment teeth, this option was doomed to fail. If one abutment tooth became a problem – as we suspected it would – then it might cause the failure of the whole bridge. A telescope-retained full upper prosthesis was considered the best option, as this restored the full upper arch of teeth, without covering the palate (as a denture would) and would be a much better fit than a dentFig.This option would cost less than implants, involve less invassive treatment and deliver a quicker result than implants. It would also have the feel of a bridge that the patient was used to and happy with. Importantly, if there is ever a problem with an abutment tooth underneath, the telescope-retained prosthesis is easily removed to treat the problem tooth and then replaced. If one abutment tooth fails, then it will not usually cause the failure of the whole prosthesis. We felt that this was a major benefit of this treatment. In one long appointment we removed the old failing bridges and treated any infection and disease in the abutment teeth. This included root canal treatment in the upper right canine tooth and removing the mesial root on the upper left first permanent molar tooth in order to clean out the infection in the trifurcation area, whilst keeping the distal and palatal roots for an abutment. After some briefings with the lab in Germany we estimated a treatment time of 5 weeks from the preparation day, including try-ins and finishing. The classic way involves constructing primary secondary crowns made of gold alloy. The secondary crowns are soldered to the chrome-cobalt frame of the prosthesis. The friction necessary to hold the prosthesis in position is based on the mechanical properties of the gold alloy. The gold alloy adds considerable cost to the prosthesis. Therefore, the TK1 method has been developed, where primary and secondary crowns are made in a cheaper chrome-cobalt alloy. This saves the cost of the gold alloy and, as the secondary crowns can be incorporated into the casting of the chrome-cobalt frame of the prosthesis, also saves the stage where the secondary crowns are soldered to the prosthesis. Here the friction is adjustable and controlled by the TK1 elements which are positioned beside the primary inner crown elements. Fig. 5: The starting point. The situation after removing the old bridges showing the lack of tooth structure, confirming why we felt that conventional bridges would be unsuccessful in the long term. Fig. 6: The abutment teeth were prepared and a Impregum impression was taken and a temporary bridge made. We made the temporary bridge thicker and stronger than usual, as it had to last a little longer and be removed and recemented at the „try-in“ stages.We then had a series of appointments to try-in the inner telescope crowns and take a locating impression with the inner telescope crowns in position. Then trying in the whole prosthesis at the wax up stage before the final fitting appointment. the tiny black place holder has to be positioned seamlessly and parallel to the primary crowns. It must be removed from the silicone mould before casting. On the investment model, the moulded placeholder is completely covered by the wax up. The first few turn of the tiny screw secure its hold in the TK1, further turns then expand the retention to adjust the friction. Every TK1 element can be easily exchanged by reversing this procedure, while the patient is sitting in the chair.